I would dye it black, add a crinoline in a fabulous bright color, and put on some heels and a bright thin belt. I think the problem is the fabric isn’t peppy but the design is. Plus it cries out for a thin belt.I like the proportion of the ruffles. My mom made herself a disco outfit not unlike this in the ’70’s. It was all shiny brown ruffles in some kind of nylon. Oh, I don’t think disagreement by its nature has to be severe – but there IS a whole lot of “if this were MY dress” going on and, en masse, it reads rather severe to me. I actually think the variety of offered solutions are awesome. It was just the “you MUST” sort of phrasing that caught a snag for me. I know I’ve been working in the finance industry* too long when my first thought was – ‘Texas Compound? Some sort of interest rate I haven’t heard of yet?’.I have one I-really-think-it-needs-it, and a few suggestions. But it’s YOUR dress, so :-)First, I think it needs a much lower neckline. 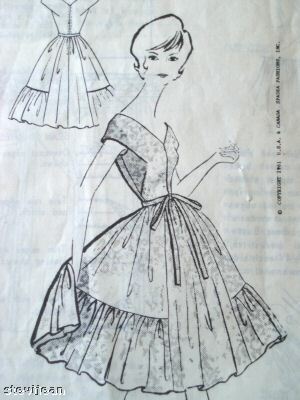 Scoop, square, sweetheart, vee, whatever you like – it’s currently strangling that poor dummy.I’m not fond of the sleeve area either – for elegant, I’d consider snug bracelet-length or slightly shorter; short and maybe fitted for a cuter look.My first thought was applique a few large splashy flowers, maybe 6-8″/15-20cm across, scattered around the skirt, and maybe one or two smaller ones on the bodice. Maybe one could overlap onto the ruffle. Oh, and short sleeves.Then a wonderful reader suggested black velvet. Yes! Bind the neck with the velvet, and the bracelet-length sleeves, maybe some velvet-covered buttons down the front, and a velvet belt or tie around the waist. 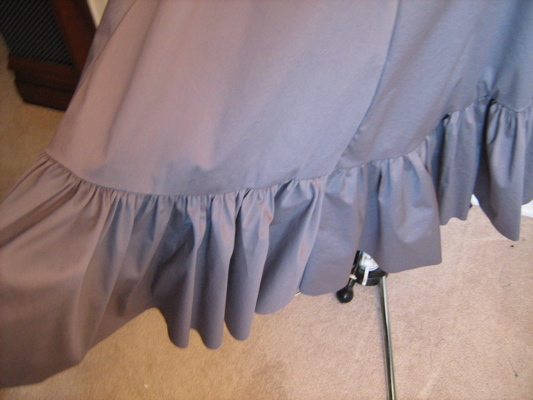 A big pouffy underskirt, peeking out from the hem, edged with more black velvet, and maybe a hint of silver. 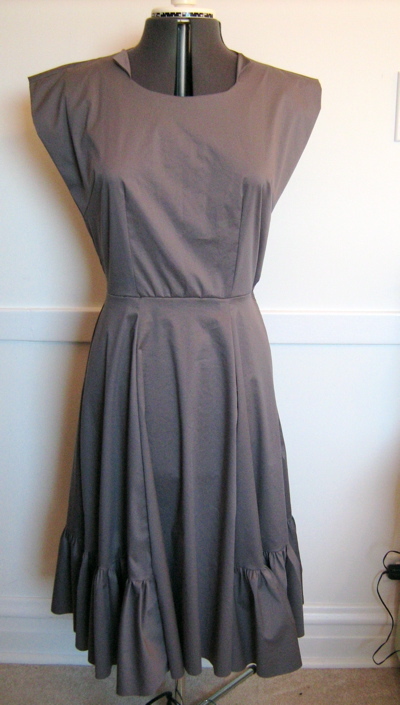 Elegant, grey, and ruffles! *Four weeks. Far, far too long. i LOVE this dress! i think it’s because of its simplicity and the ruffles! it’s a great piece to layer that’s for sure. time to bring out the colourful accessories! What a good idea Dawn! Some coloured crinoline underneath would take this dress to another level. I really like the darker accessories and then leaving the crinoline as the only splash of colour. *swoons with all the possibilities*I’d totally do a What Would You Do? series….but I don’t sew and it would seem a bit dishonest. Also…my blog is a bit of the, well, foul-mouthed variety 😉 Maybe I’ll just set up a new blog entirely purely for that? Heh. That’d be fun! It needs a big petticoat and a bold belt. Then it will be perfect…. Ooh, you just inspired me. I’ve had a vintage pattern on my mind for ages (my first!) but I was waiting for the perfect fabric to come along before I would make it. But grey is a great idea! It can be complemented with pretty much all other colours, and I’ll just make it in a simple cotton like you’ve done. Thankyou! I like the dress and like what you did to make the ruffles. The color just seems dull from what I usually see you post/wear. I think your idea of colorful jewlery will make this dress “pop”. I really like the style. For an elegant-but-funky look, I think a simple pearl necklace and then 40s-inspired yellow shoes and a matching bag would be awesome. I know the current trend is to not match your bag and shoes, but matching them would further carry across the vintage theme. Good luck! I think one of the things that Gives Us Pause is that it isn’t an obvious Erin Dress; and I do have to say that one of the suggestions about not trimming the dress “as then you’ll be limited in the colors you can wear with it” made me laugh. Not our Erin! I do think it wants Erin Colour: a wide bold belt (I think obi-style works attractively with kimono sleeves) and perhaps a crinoline to match? I think it wants more life at the hemline, and would suggest a row or two of nylon horsehair: one where the ruffle joins the skirt, and one at the hem of the skirt itself. If you are going with the Colourful Cardigan, I would suggest a narrower belt than an obi-style, but still go with the Colourful Crinoline. I do think a deeper neckline in a plain V would help.As it happens, I had a grey wool skirt with a ruffle about same width as your skirt, and I wore it to death, literally. After about 20 years, the fabric had worn to translucency! I wore it with virtually everything, at least three times a week, and loved it with black, but then, grey is right up there in my personal palette! I ended up wearing it with a skinny black leather belt, an orange cardigan (more mango than Valencia), and orange watch, and blue eyeglasses.And I ordered five more yards of the gray to try it again with a different bodice! very cute! i love the dress very much! I love vintage very much, and that dress is gorgeous! Have a great day! I think that the dress is a wadder, frankly. I am glad to know that I am not the only one who makes them. What I might try is to take horizontal tucks in the skirt to shorten it, Little House on the Prairie style. Then I would goth it up or wear it as a costume for Halloween. Elle Macpherson might be able to carry it off as a serious garment and look great, but us mere mortals will not. Don’t flog a dead horse.